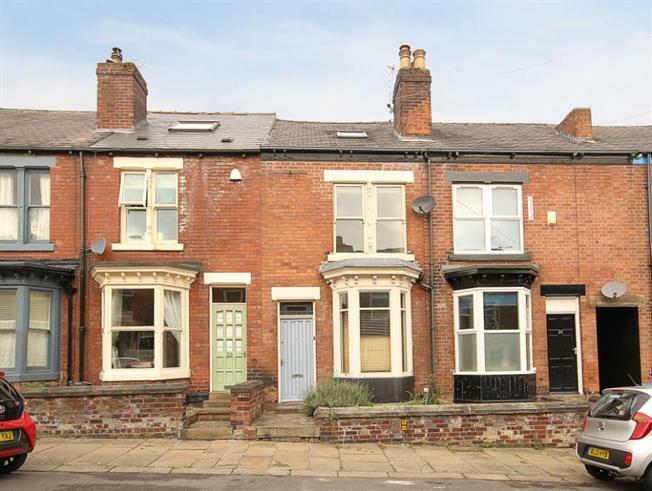 3 Bedroom Terraced House For Sale in Sheffield for Guide Price £250,000. Only by internal inspection can the overall accommodation on offer from this well proportioned bay fronted three bedroom terraced home be truly appreciated. Benefitting from two ground floor reception rooms, this well presented property offers a contemporary bathroom and rear low maintenance courtyard . Located in the highly regarded and sought after residential area of Greystones, within walking distance of Endcliffe park and a wide range of local amenities and the fashionable Ecclesall Road. Ideally suited to a family, first time buyer or young professional couple the property benefits from two reception rooms, converted cellar with a lower ground wc, three good sized bedrooms, family bathroom, gas central heating and UPVC double glazed windows. The accommodation in brief comprises: bay fronted lounge having coving to the ceiling, wood effect floor and wall light points. A door to the inner lobby. Inner lobby has stairs rising to the first floor landing and a door to the dining room where there is a rear facing window, focal chimney breast with feature fire surround. The Kitchen benefits from a range of wall and base units along with space & plumbing for an automatic washing machine & fridge freezer, as well as a electric cooker point and a side facing entrance door leads out onto the rear garden. First floor landing: front facing double bedroom one with stripped floor boards, rear facing bedroom two and contemporary family bathroom fitted with a three piece suite in white comprising: wash hand basin, low flush wc and bath with electric shower and shower screen above. Stairs rise from the first floor landing to the attic double bedroom three having front facing velux window, built in storage & wood effect floor, a door leads into an en suite shower room comprising low flush wc, wash hand basin and shower cubicle having electric shower within. Outside: To the rear of the property is a good sized flagged courtyard with raised borders. Location: Ranby Road is ideally positioned for local shops and amenities on Ecclesall Road, as well as a wide range of restaurants and cafeterias, well-regarded local schools, nearby parks and access to the city centre, train station, universities, hospitals and within easy reach of the Peak District.